On the second day of my time in Tajikistan, I was taken out of the city to see some of the sites around it, like the lower mountains over the roaring Varzob River and its teahouses, and the ancient earthen castle in the village of Hissor, Malik’s hometown. However, our main plan was to take me to the far eastern reaches of Tajikistan, into the Pamir Mountains. On Friday evening, I was introduced to Malik’s friend Saeed, who would be joining us in our trip with his all-terrain, Russian-made Lada Niva truck. Saeed was a tough-looking Tajik with a steely eye and crew cut, but he was quick to laugh and was always interested to have Malik or Farahnush translate what I was saying, or have me try to teach him a few words in English. After a delicious dinner of homemade Osh (pilaf) from Rayhon, we went to bed early, with Saeed sleeping on the floor in the living room on a mattress which looked a lot like an Arab farsha. We left early on Saturday morning in Saeed’s truck, and headed for the mountains in the south, a series of beautiful green rolling foothills that went on for kilometers, vibrantly green and with almost no trees on them. 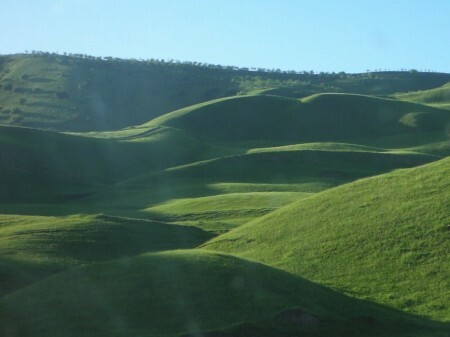 Surprisingly, they lack any trees, which made the morning sunlight catch every fold and curve in the earth in a pattern of shadows, making these low mountains a sun-warmed blanket of gently waving grass, thrown over giants sleeping below. I can't help being this poetic. Just call me Rudaki. One thing you definitely have to look out for in Tajikistan is potholes in the road. And lots of them, some of the size that could break a sedan’s axle in half if you’re traveling at the right speeds. We weren’t worried about that in the Niva, but for everyone’s health and well-being, Saeed did some pretty amazing maneuvers to avoid the worse of them. 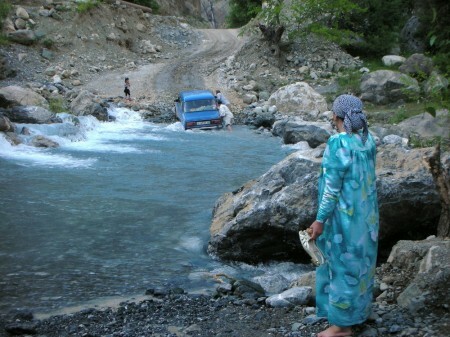 Clearly a man who knows his way around Tajik highways. The other thing to look out for is the Tajikistan “БДА” – which is pronounced “Bee Dee Ah” and is the spectacularly corrupt road police force, stationed every dozen kilometers on major highways, which checks documents, passports, registrations, and anything else that could possibly not be 100% perfect, so they can extract a bribe from you to ignore it. The combination of potholes and police made the trip a little slower than it would have been otherwise, but I didn’t mind that much as the fantastic scenery more than made up for it. Our party stopped briefly in the city of Kulob for lunch, meeting up with one of Malik’s friends in the area and visiting the tomb of one of the famous Iranian Sufi intellectuals. Farahnush and I checked out a mysterious golden monument in the center of the city, which thanks to her translation for me from a gardener, we learned that it was dedicated to the Kulob’s 2,700th birthday from a few years ago. Fairly amazing when you compare the age of a city like that to anything we have in America, or even in the most of Europe. On the way out of town, I asked Malik if we could pick up a map of the area – like the majority of foreigners, I had absolutely no idea how the country was laid out or where we were going. The only map we could find on short notice was a large, laminated wall map, but the advantage of this was that I could mark it up with a sharpie to keep track of our route. This would be our last major city for several days as we traversed the wilderness between Kulob and Khorog, our final destination, so we filled an extra gas tank to put in the trunk; better to be safe than sorry. For the first time, I saw a less modern way to fill a car’s tank – attendants dragged buckets of gasoline over to the car, and poured it through a funnel directly into the tank. It seemed pretty large risk of flammable danger to me, and the smell of raw gasoline fumes exposed to the air were quite potent, causing Farahnush to wrap her head with her new red keffiyeh until we were done outside. 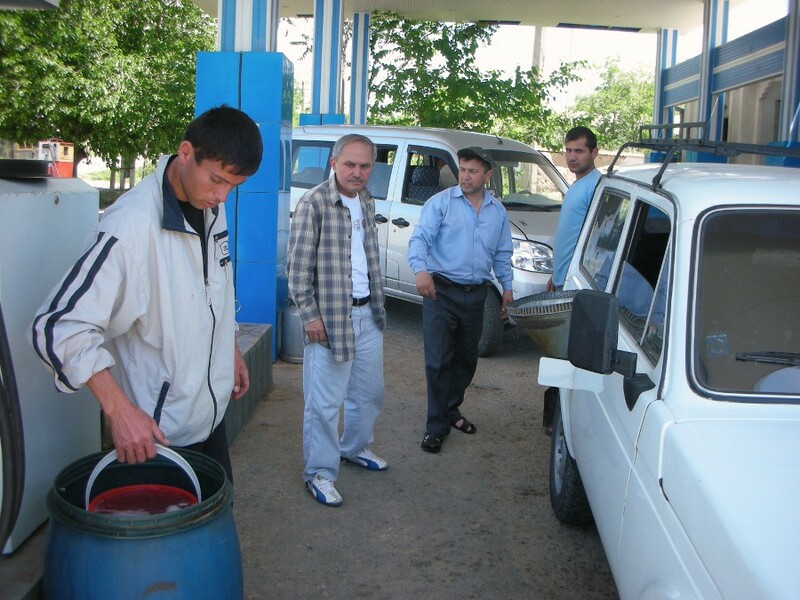 “Don’t worry, we use fuel pumps like everyone else in Dushanbe,” she pointed out. We left Kulob behind and the road went from “usable by your average car” to “possibly dangerous” within a matter of minutes, and the amount of traffic dropped to a trickle. The brilliant afternoon sun shone into the car brightly and the snow-covered mountains in the distance grew ever closer as we bounced along over the boulders in the road, finally coming to a roadblock and sign telling us we were entering the risk zone along the Panj river, the border and only separation between Tajikistan and Afghanistan. I was required to give up my passport for a few minutes so they could register me in an archaic, dusty green book that looked like it had been used by the Soviets (and in fact, it probably had been). The others had their passports glanced at briefly as well, but mine was the main interest – the bored guards flipped through it curiously, as American tourists in this part of the country are extremely rare. Within fifteen minutes we came in sight of the mighty Panj – a roaring muddy brown torrent that rages for a thousand kilometers before emptying into the Aral Sea far behind us. At this particular point, the river looked quite wide, and very dangerous as well – about 20 meters of rapids crashing against huge rocks below us. Cows grazed unconcernedly in the road as our white truck barreling past them, and farmers wearing the traditional toqi hat casually flicked long sticks at them to move them higher into the rocks. I squinted over the river towards the sunny cliffs, realizing that I was looking into the infamous country that was the site of the original “War on Terror” started almost a decade ago. In the media, we hear of the death and destruction in the south, around the capitol of Kabul – but nothing could be further from what we saw here. Nothing but cows, grassy fields, and broken cliff-side, stretching away in all directions. If you didn’t mind the distance and lack of more westernized amenities, you couldn’t ask for a more picturesque place to live. Except for the landmines. I was drinking from my seltzer water bottle (which is the norm in Russia/Central Asia instead of the regular uncarbonated variety in America and Jordan) and almost choked on it when we passed an angry-looking yellow sign with a descriptive drawing of someone’s leg being blown off at the knee. I couldn’t read the Russian lettering on it but the meaning was clear – don’t get off this road, and don’t go down to the water. Malik explained to me that during the slow collapse of the Soviet Union, the area was seeded with landmines along the border to prevent migration between the countries. The area of land is just too large to cover with a fence or with guards – although we did occasionally see border guards, groups of three with machine guns patrolling the road every few dozen kilometers. Instead, the threat of death or maiming by mines had to serve the intended purpose of warning civilians that to go to the river is to gamble with their lives. Uh...I'll keep my knees intact, thanks. We continued to see the signs, placed every couple of kilometers, for about 30 kilometers. I would occasionally see gaping holes in the road, 5 meters deep at least, surrounded with crude rock barriers to prevent cars from nosediving into them during late night drives. I joked that they were landmine blasts, but it was more likely that it was the result of landslides or sections of the mountain collapsing. The river roared hungrily below us, sometimes 2 meters away, sometimes 40. No guardrails here besides distantly-spaced concrete blocks with faded Cyrillic on them: there would be no AAA, no quick response; nothing to save you here if you suddenly slid from the road into the mighty Panj. In the video below, we’d come to a waterfall, which looked small from a distance, until I realized it was still a kilometer away when first glimpsed. As we drew even nearer, I realized that we weren’t just going to go past it – we were going to go under it. Apparently I hadn’t sealed the door quite properly: I got splashed down my right side as we drove through the torrent. As we traveled, we came across many springs and streams flowing cheerily through the rocks. Some of them were safely under the bridges that had been built during the Soviet era, but newer streams rapidly turned into rivers and in some places threatened to make the entire road impassable. “Especially in this region, people have very fond memories of the Soviets,” Malik told me. They built roads, schools, and broad modern technology into a region which previously had never seen the outside world. Compared with the current government, led by Emomalii Rahmon, the Soviets were bright beacon of hope and progress. Now however, the roads are over a half-century old and their future repairs are unknown. However, we did pass by a large-scale road construction crew two hours into the mountains, complete with air jacks blasting away at the rocks, dump trucks and trailers transporting materials, and piles of iron rebar. Did I mention that these roads were very dangerous – and that’s in a small truck! The thought of anything larger veering around these corners over the river is incredible, by which I mean insane. At one point we came across a small sedan, stranded in the middle of a 10 meter wide river as two men pushed futility at it, knee-deep in the water. A woman stood on our side of the river watching the proceedings, fretfully wringing her fingers together. After our Niva easily crossed the blocked path, Saeed and I joined the two men with a rope tied to the front bumper and together we pulled the car slowly from the mud and onto the far bank. I gave the pull count in Tajik, calling out “yak, du, sey! yak, du, sey!” which means “one, two, three!” The family gratefully thanked us repeatedly and invited us to their house for dinner, which we politely declined, knowing that we wanted to make it to Khalai-Khumb, the largest village in the Darvos region with almost 2,000 people, before we were driving these roads by nightfall – not recommended. Malik told the family that I was a visiting American, at which the older man, a sheikh with a long white beard and cap perched precariously on his head, shook his head in pleased amazement and told us he couldn’t believe an American of all people would be out here, much less helping him with his family’s car! 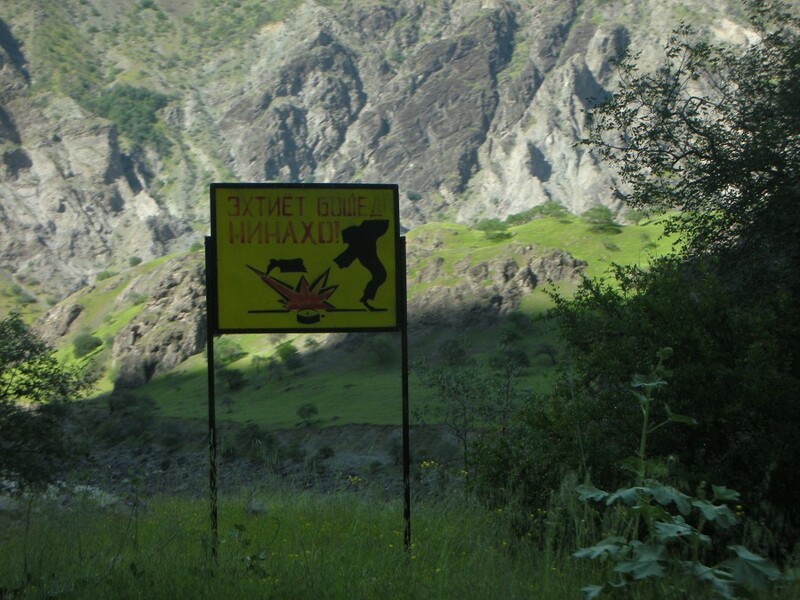 We neared Khalai-Khumb, but we weren’t out of the mountains yet, so to speak – ridiculously enough, we came across a БДА station, complete with a gate and police officers with machine guns. We went through the usual song-and-dance of registration, but there was a new “request” from the men: transport one of their own to Khalai-Khumb to the barracks there. You don’t deny the БДА a request, so what could we do? The young man squeezed into the back seat with Farahnush and Malik, shoving his machine gun barrel into my jaw as he did so. I was sincerely glad I had watched him remove the clip from it beforehand. Through Malik, I asked him if all traffic police carried machine guns, or whether it was just him – he replied that it was because they were on the border with Afghanistan and they needed to prevent terrorist attacks. The БДА elsewhere would just have pistols and nightsticks. Raising an eyebrow, I gazed across the river at the utterly peaceful slopes of the mountain. 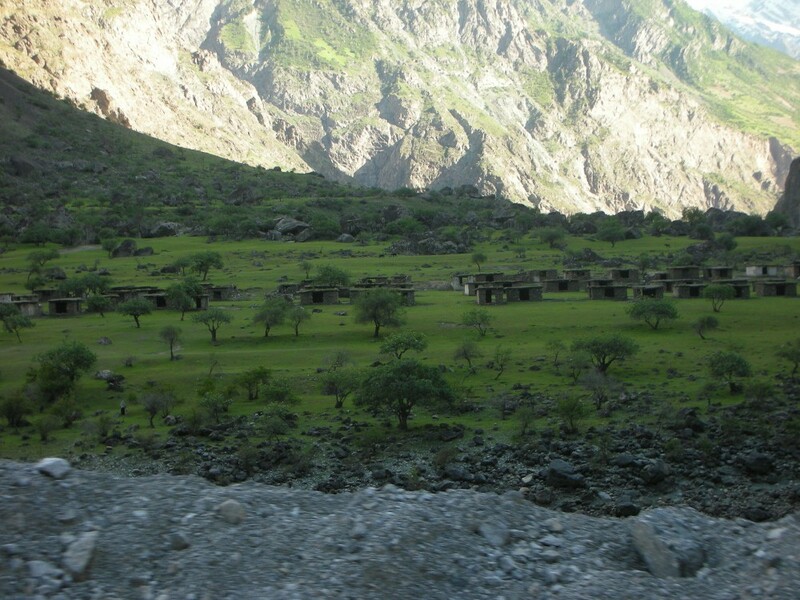 Compared with the villages, power lines, telephone poles, and roads of the Tajik side of the border, the Afghanistan side was lucky to have a single dirt road and mud houses. In the past 4 hours, I had seen many 5-6 people, all of them farmers leading donkeys or flocks of sheep to the river (apparently un-landmined). But hey, if the БДА wants to play it safe, that’s their business. With only a couple dozen kilometers left before reaching the village, the road opened up into a blissfully paved stretch, and I realized my rear parts had gone partially numb from the bouncing. One thing’s for sure – I’ll never complain about American or Jordanian roads again! Oddly enough, I don't feel horribly threatened by this Afghani mudhouse village. We reached Khalai-Khumb at around 7, dropped off our silent friend at his barracks, and found a hostel to stay at, a cheery blue-and-white building labeled “Homestay” on a sign by its gate. The owner, a white-haired older gentleman who enthusiastically welcomed us, led us to our rooms and whipped up a simple but tasty dinner of soup, bread, and vegetables within 20 minutes. Darkness quickly fell over the village as the sun was swallowed behind the clifftops surrounding us, and the peaceful sound of the river lulled us to sleep. Tomorrow, we should be in Khorog, the capital of the southeast territory of Tajikistan, where we’ll spend a couple days before heading back along a new route. “less modern way to fill a car’s tank” – lol, you know how to be polite. The mountains look beautiful! Sounds like a scary trip though. Glad that you made it through. You will have to show me more pictures when you get back.